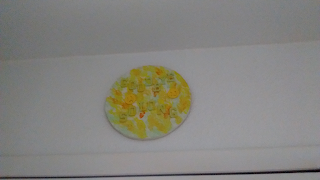 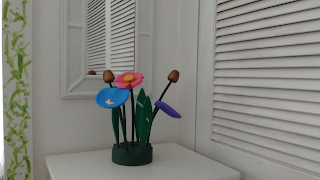 Crafts, not art? Yup! 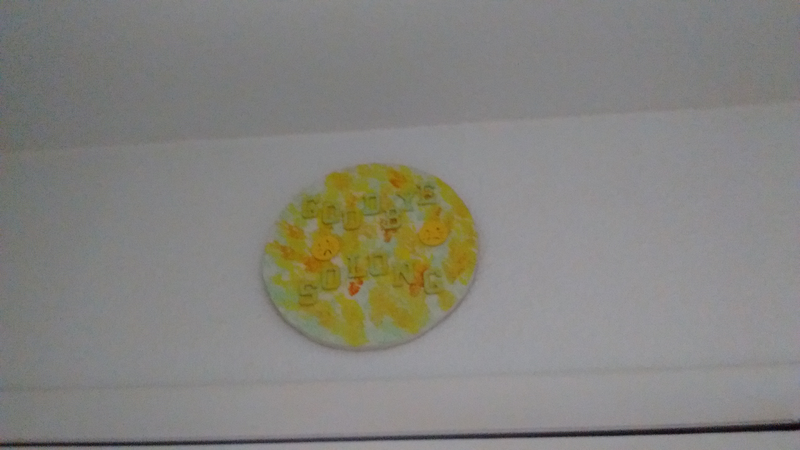 Blog 3249. 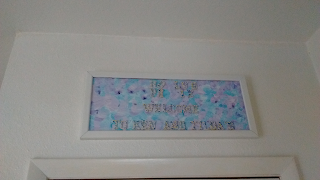 Hubby cut the board, and I painted it a deep teal, glued wooden letters and embellished with dried flowers and clip art, located over the bed in the guest room. 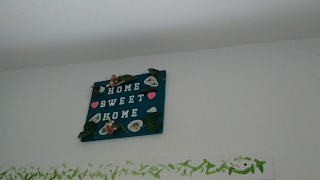 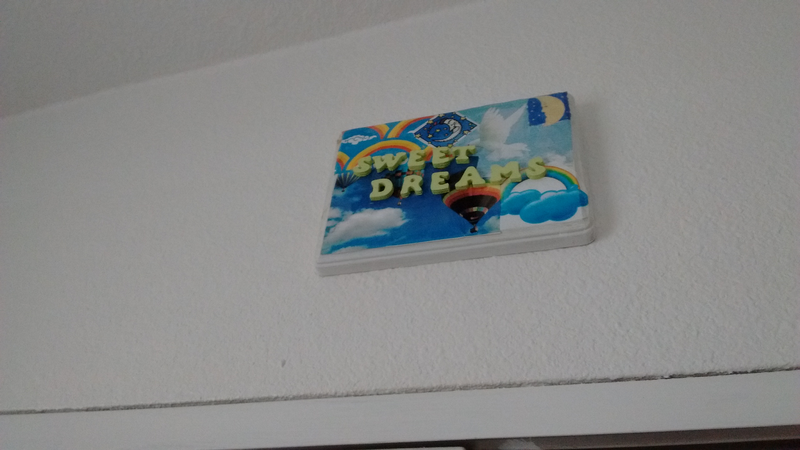 Trying to make any guest feel at home. 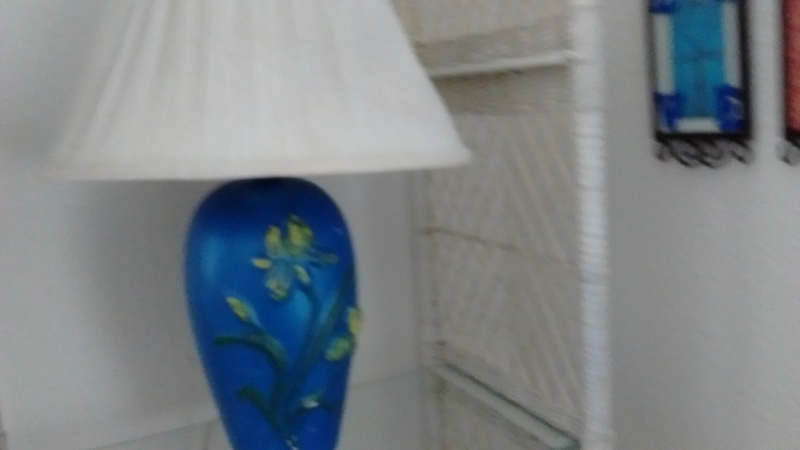 Beige ceramic raised patterned lamp painted the monotone colored piece, and even the beige shade was painted white too! 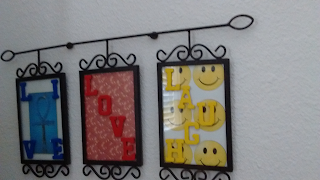 Wrought iron and glass Walmart picture frame set, my idea of the famous encouraging lament. 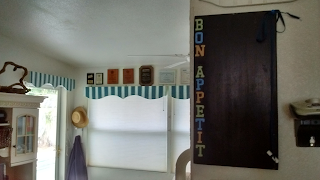 Card stock, clip art PICS again, and wooden letters again. 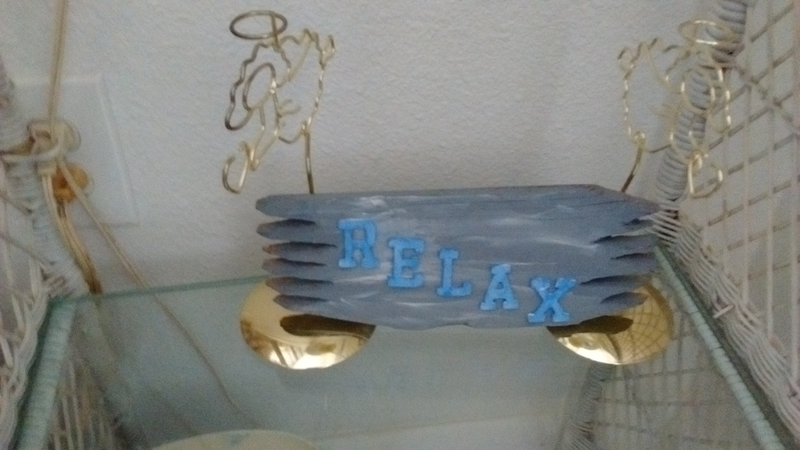 Hubby cut the wood that I requested to be shaped like drift wood, and then I painted it that color, driftwood, and again light blue calming wooden letters. 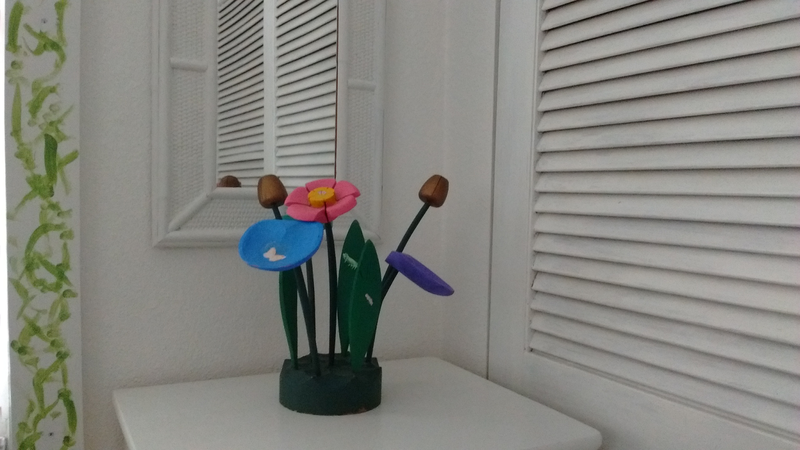 I did not carve these flowers if I could I wood/would, ha, instead they were from an old friends no sale at our garage sale. Skipper was a pup then and teethed on them so to fix the all natural wood problem, I gave it some loudness! 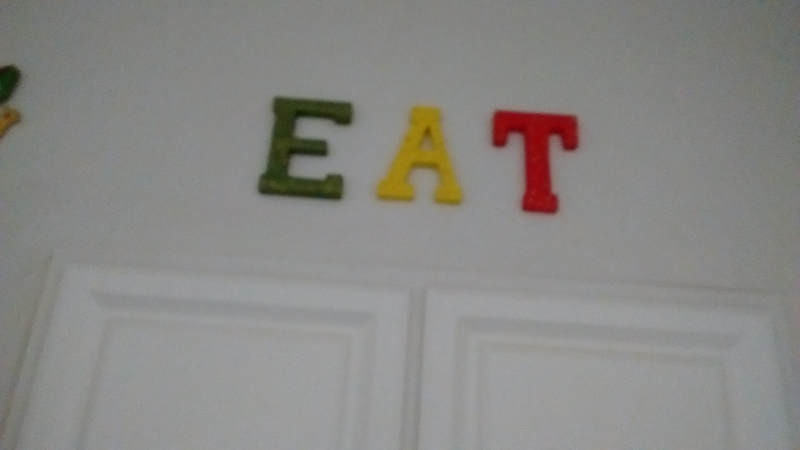 Bought letters again , but painted and polka dotted them, hard to see, but they match the store bought lizard to its left. 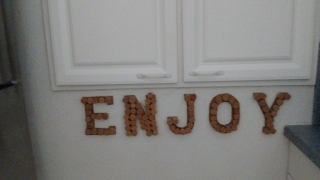 This one you most recently saw, cork letters on old floor boards. 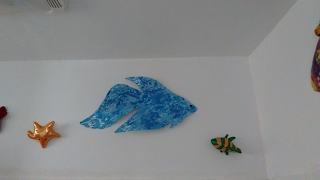 My $1.80 thrift store metal rusty fish, I like his blue mood! 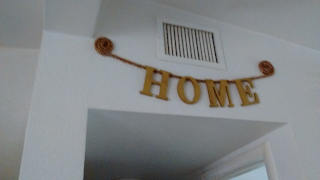 This one too many have seen, 6" wooden letters from Walmart under five bucks, sprayed gold, and hot glued to the nautical rope. 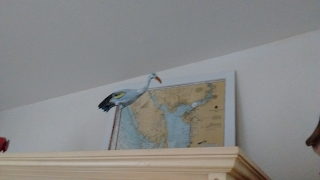 Hubby's plastic coated chart of Charlotte Harbor, our canal is seen pretty much where the heron is pointing down to! 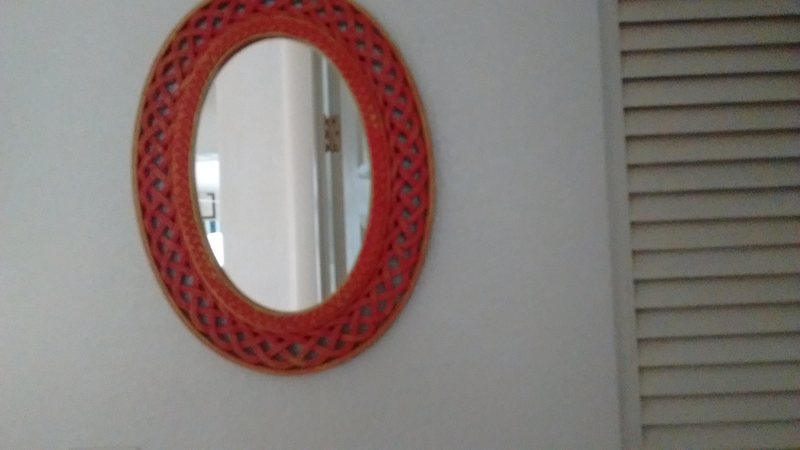 A cute door rug that I loved the edges had frayed and Hubby had leftover cedar fence and voila! Card stock artwork in our/my seashell themed bathroom. 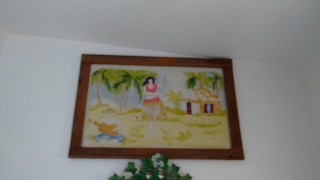 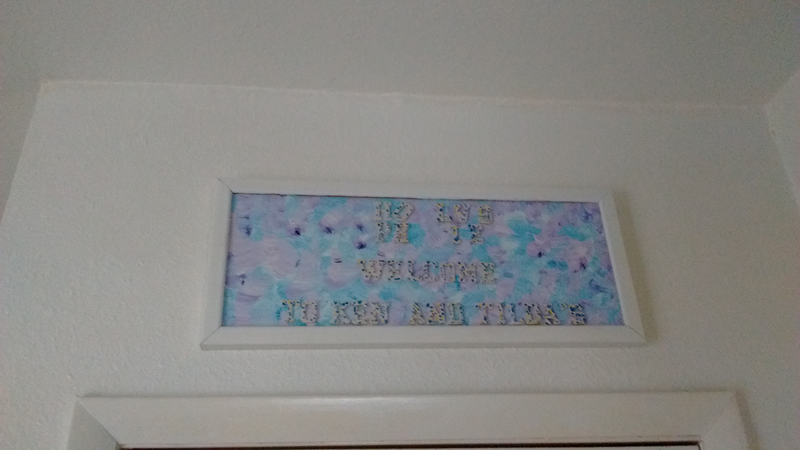 Frame painted by me, most all frames are bought cheap at thrift stores. 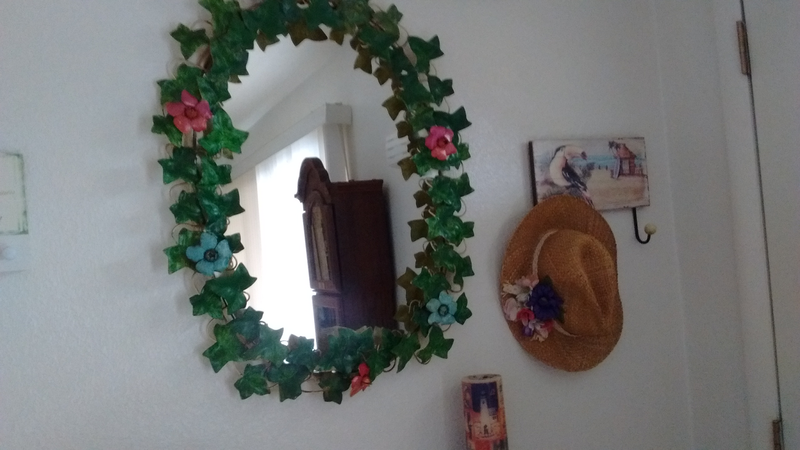 Metal mirror came with the house, was olive green and paler, I jazzed it up, but it is in need for a redo! Another city flea market sale, plastic brown wicker mirror, a dollar, painted poppy with gold flecks, by moi! 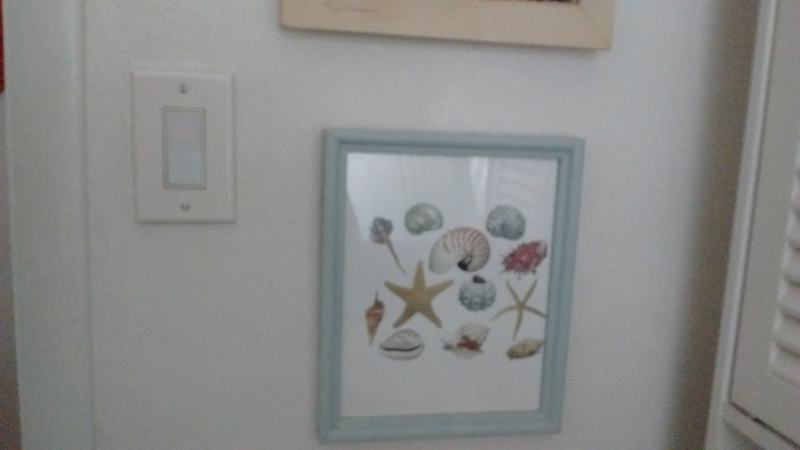 Hubby did the wood cutting and I did the designs and painting, coming and going! 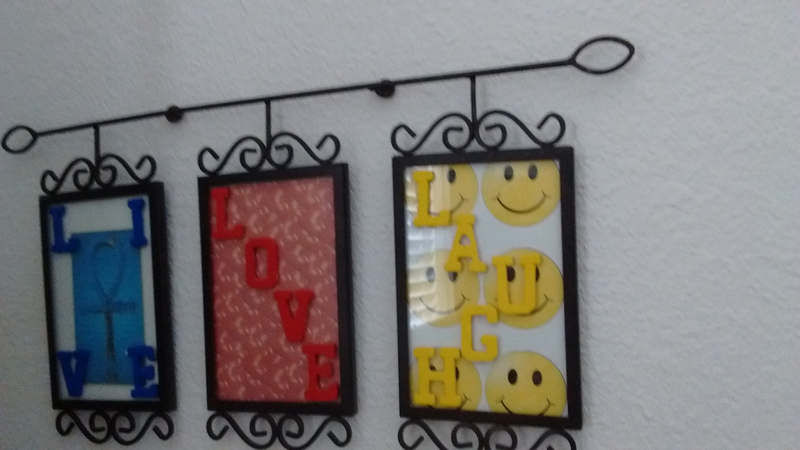 The yellow one is So long, goodbye, with emoji's crying. 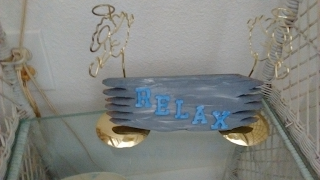 The blue one welcome's you with a design copied from the artist know as INDIANA, he did PEACE and LOVE signs notably in the sixties, stacking letters on top of each other. with raised lettering again bought. Chalk board with spray chalk paint and wooden letters!